Being sold with no chain, therefore ready for immediate occupation is this well-presented and improved three bedroom mid row family home, which would make a perfect purchase for a first time buyer who is ready to buy their first home! Situated in the centre of Liscard close to the good range of nearby amenities and shops, including frequent bus links to New Brighton, Liverpool and Birkenhead. Only a short walk to the promenade, Central Park and well placed for excellent local schooling especially Liscard Primary School. Interior: porch, hallway, living room, dining room and well planned spacious breakfast kitchen on the ground floor. Off the first floor landing there are the three bedrooms and bathroom. Exterior: pleasant rear courtyard garden which is paved for ease of maintenance. Complete with uPVC double glazing and gas central heating system. Viewing is absolutely essential in order to appreciate this lovely home in full. LIVING ROOM 13′ 01″ x 12′ 01″ (3.99m x 3.68m) uPVC double glazed bay window to front elevation. Dado rail, television point and meter cupboard. Central heating radiator and coal effect living flame gas fire set in decorative surround. 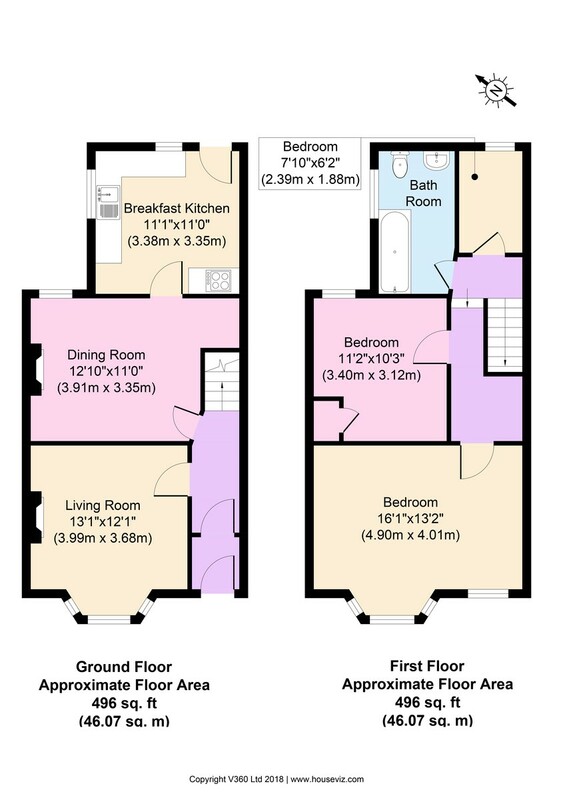 BREAKFAST KITCHEN 11′ 01″ x 11′ 0″ (3.38m x 3.35m) Well planned and spacious breakfast kitchen with two uPVC double glazed windows and a uPVC double glazed door to rear courtyard. Matching range of base and wall units with contrasting work surfaces over and tiled splash backs. Sink and drainer with mixer tap. Inset four ring gas hob with oven below and extractor fan above. Space and plumbing for washing machine and fridge freezer. Integrated ‘Bosch’ dishwasher. Breakfast bar with central heating radiator below. Tiled flooring and cupboard housing the combi boiler. BEDROOM ONE 16′ 01″ x 13′ 02″ (4.9m x 4.01m) uPVC double glazed bay window and further uPVC double glazed window both to front elevation. Television point and central heating radiator. BEDROOM TWO 11′ 02″ x 10′ 03″ (3.4m x 3.12m) uPVC double glazed window to rear elevation with storage cupboard and central heating radiator. BEDROOM THREE 7′ 10″ x 6′ 02″ (2.39m x 1.88m) uPVC double glazed window to rear elevation with central heating radiator. BATHROOM uPVC double glazed frosted window to side elevation. Suite comprising panel bath with shower attachment and screen, low level WC and pedestal wash basin with mirror above. Central heating radiator, part tiled walls and tiled flooring. REAR EXTERIOR A pleasant rear courtyard garden which is paved for ease of maintenance with timber shed and outside light. Rendered boundary walls with fencing and timber gate. LOCATION Vicarage Grove is a turning off Greenwood Lane, found off Withen’s Lane approx. 0.7 miles driving distance from our Liscard office.